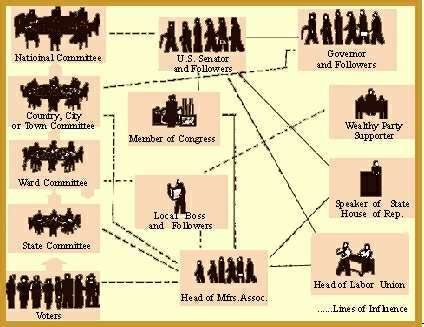 Party history in America, shows that two major parties are one of the more permanent features of American politics. Yet, elements disputing over policy issues with these two, form third parties. In most of the elections there have been third party candidates belonging to the Know-Nothing Party, the Greenback Party, the Populist Party, the Prohibition Party the Farmer-labor Party, the Socialist Party and various progressive parties. They have provided an electoral base for capable leaders like Eugene Debs, Robert La Follette, Norman Thomas, Henry Wallace and George Wallace. They have helped to organize specific interest groups like anti-slavery people, prohibitionists, vegetarians and left-wing trade unionists. In 1912, the split in the Republican Party gave rise to two strong Republican candidates William Howard Taft and Theodore Roosevelt, in the race against the Democratic candidate, Woodrow Wilson. Strom Thurmond left Democratic Party in 1948, to become a candidate of the State’s Right party, being opposed to the civil rights program of Harry Truman. Similarly, George Wallace of Alabama stood for election as a candidate of the American Independent party in 1968. Unhappy farmers, Western mining interests and the southerners joined together to form the Populist party which won several seats in the Congress and electoral votes in 1892. In 1924, the Progressive party revived this coalition of the farm and labor groups. Such parties may touch both the extremes of the political scale. The Socialist Party’s candidates received considerable votes between 1904 and 1920, while the Libertarian Party grew stronger at local and state levels. Certain specific issues form the basis of some parties for example the American Party, also called the Know-Nothing Party wanted an end to immigration to the United States in the 1850s, while the Prohibition Party was against the consumption of alcohol. Though the third parties had turbulent roles and charismatic leaders, the system basically operates against them. Thus short-lived competitors to the major parties entered the scene, from time to time. In 1912, Robert M. La Folletter led a progressive movement, while in 1936 William Lemke led a so-called Union Party. Sporadic success was obtained by progressive candidates and Farmer-Labor candidates in local elections, and the socialist party led by Norman Thomas appeared both on national and local ballots. However, except for such few instances, third party candidates rarely manage to influence the presidential elections in a major way. The nature of the American electoral system is largely responsible for the two-party system. There is a single incumbent in most of the election districts, so that the candidate with the maximum number of votes wins. Thus the largest and second largest parties monopolize the victories, since only one candidate can win. The third party finally gives up the fight, because it is deprived of the rewards of office. Though the Populists, the Progressives and the Socialists managed to attain seats at the local and state levels, their numbers were insignificant. Moreover, the costs of campaigning are enough to deter aspirant third party candidates. Therefore, while the two major parties monopolize the presidency, the third parties gradually wither away, since they are deprived of patronage and power. Yet third parties are often able to modify the programs of the major parties. A more decisive and progressive stand upon issues is taken by third parties, than the major parties. If a large number of voters are attracted to such a party, the major parties try to take over part of the third party’s programs. Thus, the third party does make American politics more dynamic and progressive. 654 PinkMonkey users are on the site and studying right now.